CNG: Printed Auction CNG 75. MYSIA, Kyzikos. 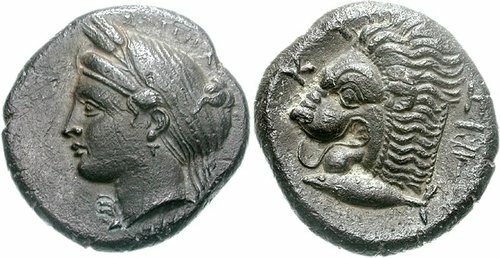 Circa 390-341/0 BC. AR Tetradrachm (14.66 g, 12h). Sale: CNG 75, Lot: 341. Estimate $1000. Sold For $1320. This amount does not include the buyer’s fee. MYSIA, Kyzikos. Circa 390-341/0 BC. AR Tetradrachm (14.66 g, 12h). Head of Kore Soteira left, wearing single-pendant earring, hair in sphendone covered with a veil, two grain ears in hair / Head of lion left; below, tunny fish left; caduceus to right. Pixodarus Type 2, Group C; SNG France 399. Good VF, even dark find patina, minor marks on surfaces.